Lionbridge Work at Home : Get Paid to Search the Web! Do you love searching online? Then a Google work from home position might be a great fit for you. Find out more about this position and Lionbridge work at home opportunities. 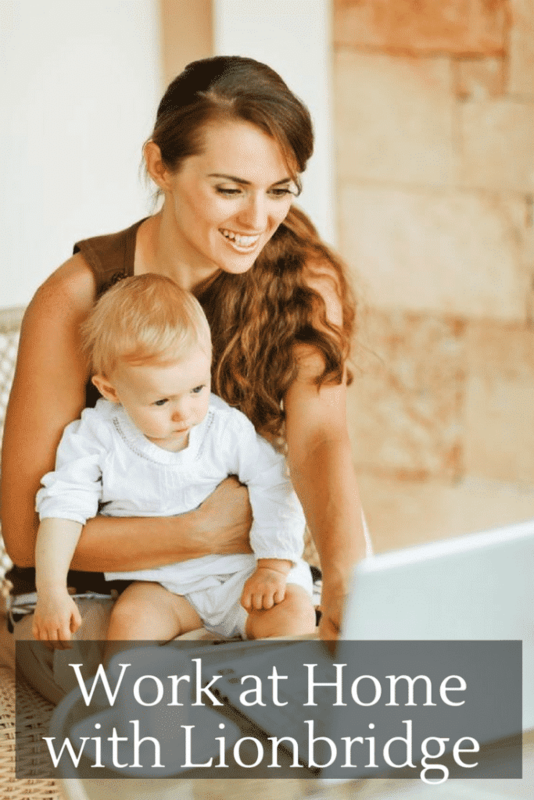 This is a great position for stay at home moms because it is super flexible and is also a non-phone job so you don’t have to worry about noise in the background. They hire for a wide range of positions but, similar to Leapforce, and other search engine evaluation companies, they hire for many work at home positions. Other work from home positions they hire for include ad assessors, raters, translators, and interpreters. They hire internationally so you can live anywhere and work for this company from home. What Would a Lionbridge Work at Home Position Do? As a search engine evaluator in a Lionbridge work at home job you would be helping to evaluate search engine results by adding a human element to how search engine algorithms work and ensuring that the search engine results you and I get every day are accurate and relevant. If you work as an ad assessor you would be checking the content of internet search results but in the context of ads. In either position you will have the flexibility to choose your own hours. Hours are a minimum of 10, maximum of 20 hours per week depending on availability. What Are the Requirements for a Lionbridge Work at Home Search Engine Evaluator Position? Here is some info directly from the Lionbridge website in regards to this specific position. “In this job you will be accessing tasks both “on the go” and from your desktop PC at home using both a custom App on your Android smartphone and your desktop/laptop PC, you will be evaluating Apps and product quality and online search results in order to improve their content and quality. You will be required to provide feedback on content found in new products and search engine results. You will play a part in improving the quality of one of the largest search engines in the world using both your desktop PC and Android cell phone device. We are currently seeking highly tech savvy, dynamic and creative Android users who have a familiarity with a wide variety of Apps in the Play Store and have a strong interest in all forms of social media, specifically those who are an active daily user of their Gmail Account. We require suitable candidates to own & use a Desktop/Laptop as well as an Android cell phone device and have the willingness to keep their Android updated to the latest OS version (currently v6.0 Marshmallow), you must be familiar with downloading Apps on your Android smartphone and you should also be willing to download certain required Apps through the Play Store. You are also required to use your desktop/laptop PC in conjunction with your smartphone to complete certain tasks. Hours for this role are a minimum of 3 up to 5 hours per week depending on task availability. You should be flexible, reliable and an Avid Android cell phone user who regularly downloads Apps through the Play Store. In this role you will have the freedom to work from your own home, working your own hours. For the mobile tasks, you will receive push notifications when tasks are available through the custom Android App that you will be required to download. We are seeking people who specifically have a desktop PC and an Android cell phone running the latest OS version (currently v6.0 Marshmallow) and the Google Search App installed to complete tasks. You must own and use an Android Smartphone (we require users to have the latest OS version currently v6.0 Marshmallow) to complete tasks. Active daily user of Gmail, Google+ and all forms of social media including Twitter & Facebook. Some tasks will be personalized/Social Media based. In order to qualify for these Lionbridge work at home positions you need a computer with Windows 7, 8 or 8.1. Apple OS or older versions of Windows are not acceptable. You must also have a high speed internet connection with a minimum upload speed of 1mpbs. There are no fees involved in this position. You can apply for positions available in your country at Lionbridge.com. Once you are contacted for a position you must pass an online assessment before being hired. Lionbridge also hires for work at home positions for translators and interpretors as well. Among the more popular companies that hire for similar positions are Google, Leapforce, and Appen Butler. To find other kinds of companies that hire regularly visit the work at home companies page. For other positions similar to this you can try FlexJobs. Every job listing is hand screened and 100% verified. This post may contain affiliate links but I only share work from home information I believe valuable to my readers.